Figure out what to plant and where to plant it with free online garden planners. 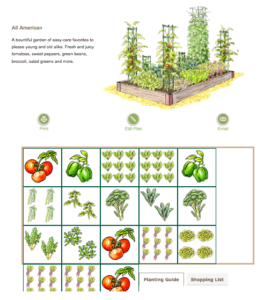 Gardener’s Supply Company has a fabulous online kitchen garden planner that is great for planning your vegetable garden. You can check out their 16 pre-planned kitchen gardens, or customize your own kitchen garden based on the size of your garden bed. Choose from more than 50 crops to plan vegetable beds or rows up to 25 feet long. The drag and drop feature makes it easy to envision what your garden will look like and there are tons of gardening tips to help you get the biggest harvest from your small space. Better Homes and Gardens has an easy-to-use drag and drop garden planning tool. This tool focuses on designing a beautiful outdoor space by allowing you to map out where to plant shrubs, trees, annuals and perennials. You will have to register on the site to access the Better Homes and Garden online garden planner, but it is free to join. Garden Planner 3 is a free tool that allows you to design your outdoor space. You can design and print your plans for free, but you’ll have to download the premium software (which costs $24) to be able to save your designs. The free version of the garden planner lets you design flower gardens, herb gardens, vegetable gardens and more, and you can download a free 15-day trial of the full software. Mother Earth News has a vegetable garden planner to help you decide what food to grow. This app requires Flash, so you’ll have trouble if you try to access it on an iPhone or iPad. In order to use the design tool, you will need to create a log-in for the site (it’s free), you’ll be able to save your designs for free for up to 30 days. An annual subscription is $25. For those of you who don’t enjoy using computer software to design your gardens, you can find free printable garden planners online. The $5 Dinner Mom has some of the nicest free garden planning worksheets to print. Design your space and track your progress with these stylish printables. D&G Garden and Crafts has a collection of free printable garden journal pages perfect for putting together a gardening journal. Vegetable Gardening Online also has a free vegetable gardening diary to help you plan your garden and document its growth. Plan your garden before you head to the greenhouse to buy plants and you’ll avoid spending money on things you don’t need. You’ll also be in a better position to know what questions to ask when buying plants so that you get the best value for your money.